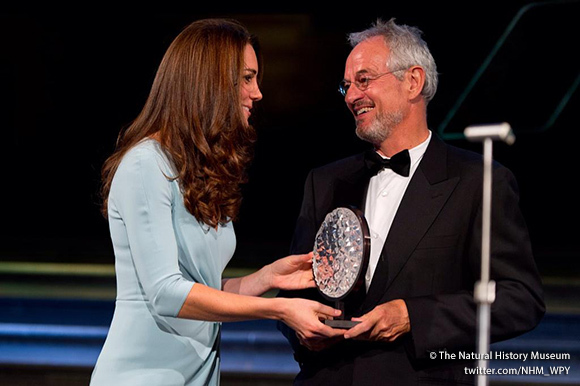 On 21st October 2014, The Duchess of Cambridge attended the Wildlife Photographer of the Year awards at the Natural History Museum. The Wildlife Photographer of the Year competition is billed as the world’s most prestigious nature photography event. The annual competition is open to all ages, and there are categories for both amateur and professional photographers. This year’s competition is very special, as it’s the 50th anniversary. During the awards ceremony, Kate met the finalists of the Wildlife of the Year competition, and viewed the photography exhibition within the museum. You can also visit the museum and view the exhibition, and see the winning photographs. The exhibition will run from 24 October 2014 – 30 August 2015. Click here for more details. 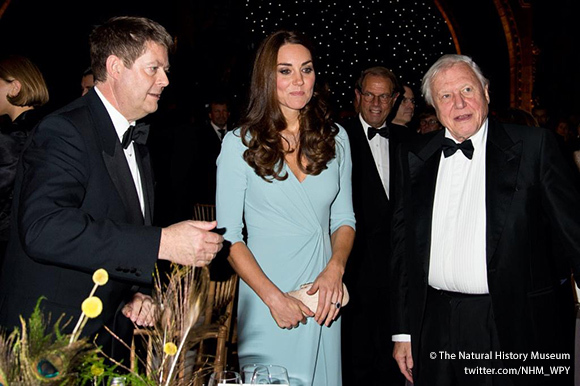 Kate presented awards to the overall winners with Sir David Attenborough, wildlife presenter Liz Bonnin and renowned wildlife photographer Frans Lanting. As you’ll recall, Kate is Patron to the Natural History Museum, and she’s attended a number of engagements at the London-based building previously. The awards ceremony was Kate’s second engagement of the day. Earlier, the Duchess met the Singaporean President and formally welcomed him to the UK on behalf of The Queen. You can read more about that event by clicking here. Kate looked stunning in a baby blue dress, worn with light pink accessories. Kate’s pastel blue dress is by Jenny Packham, who described the colour as “pale jade” in an Instagram post shared during the evening. Packham also confirms the dress is a bespoke piece. The Jenny Packham sequinned evening gown (left) currently retails for £ 2,965 at ShopBop.com. Kate’s new pink clutch bag is by another one of her go-to designers, Alexander McQueen. 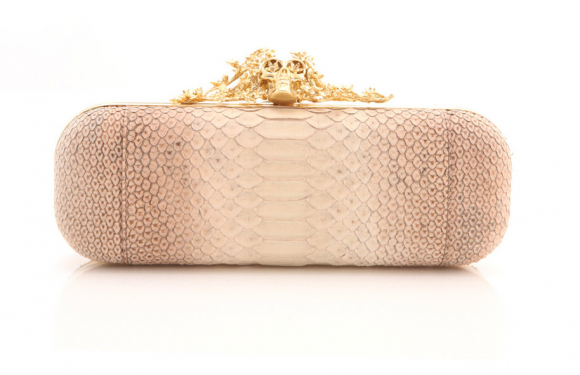 Kate’s clutch appears to be based on Alexander McQueen’s pink python clutch, but with a new, bespoke clasp. (As regular Kate followers will know, the Duchess opts for bespoke clasps on all of her Alexander McQueen clutch bags – I suppose you could say the skull clasps aren’t very regal!) This bag was part of a past collection and was available at MatchesFashion.com for £1450. We saw a return of Kate’s L.K. 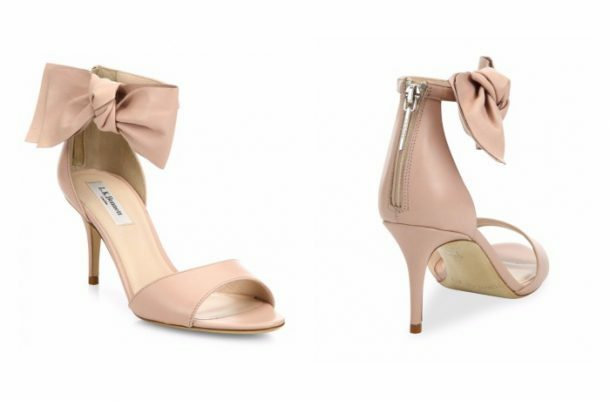 Bennett Agata bow sandals, last worn publicly by Kate to the ARK Charity Gala in 2011. Kate also paired the shoes with a Jenny Packham dress back in 2011. Both pieces are from the Riva collection. The necklace was available exclusively to Harrods, but the designer has now made it available on her site too. It costs £2,000. The matching earrings cost £745. 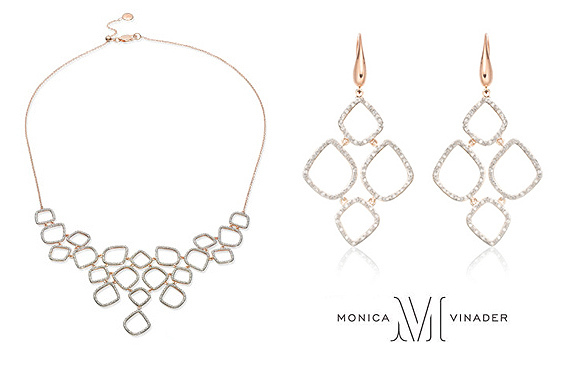 Both pieces are part of Monica Vinader’s signature “Riva” collection and are made from rose gold-plated stirling silver and pavé set diamonds. Monica Vinader offers free delivery in the UK & USA. « Kate’s back! First public appearance since announcing she’s expecting baby #2! Kate is amazing all the time . determined to achieve her objectives.